In April of last year, Whole30 advocate Shannon Colavecchio of Badass Fitness put together a hilarious (Un)Official Whole30 Glossary. Her post got us thinking – there are an awful lot of acronyms, words, and phrases that are unique to the Whole30-sphere. 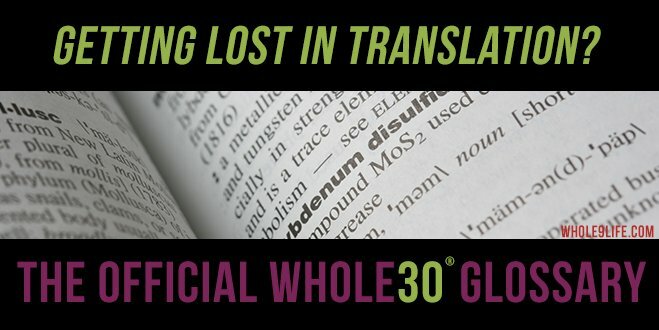 Since we’d hate for anyone or anything to get lost in translation, we decided to create the official Whole30 Glossary here, just for you. In this list, you’ll find terms that are common here on the 9Blog, on our Whole9 and Whole30 Facebook pages, and in general Whole30 conversations on our forum. We’ve also included a few entries from Shannon’s original article… because they were just that good. An autoimmune disorder is a condition that occurs when the immune system mistakenly attacks and destroys healthy body tissue. Examples include lupus, psoriasis, PCOS, rheumatoid arthritis, and multiple sclerosis. A specific dietary protocol for those with autoimmune conditions, as spelled out in It Starts With Food and in our AI Shopping list. When people accidentially (or purposefully) eat something off-plan during their Whole30, they’ll often ask if they need to start over. Consumption of the “big three” foods, even in small amounts, generally warrants a Whole30 restart. Many Whole30ers make a habit of batch-preparing and storing meals for the upcoming week during a “weekly cookup” (a term made popular in the cookbook Well Fed), generally on Sunday. These short-chain carbohydrates found in some foods are poorly absorbed in the small intestine, but can be fermented by bacteria found in the gut, leading to digestive troubles like gas, bloating, and motility disorders. The Whole30 is very adaptable to a low-FODMAP lifestyle. A term introduced in chapter four of It Starts With Food. Refers to carbohydrate-dense, calorie-dense, nutrient-poor foods (like chips, crackers, cookies, or other sweets) that once we start eating, we just can’t stop. A short-term period when you literally feel like you went toe-to-toe with Jack Daniels – and lost. Our Whole30 Timeline will give you more details about what to expect during your Whole30. That step past hungry, when everything other than food (and everyone in general) is completely intolerable. Some folks experience this during the first few days of their Whole30, but as your body gets used to running on stored energy, the blood sugar issues responsible for this phenomenon become few and far between. The New York Times bestselling book by Dallas and Melissa Hartwig (creators of the Whole30 program and founders here at Whole9). The days during your Whole30 experience marked by significant crankiness. Our Whole30 Timeline will give you more details about what to expect during your Whole30. The less-healthy stuff that other people (grandparents, teachers, sports coaches, and the like) want to feed your children. See these articles for details. Refers to food or drinks consumed before and after a workout or exercise session. A stereotypical western (American) dietary pattern: high-sugar desserts; processed foods; low fat, “sugar free,” food-like products; refined grains; fast foods; high-sugar beverages; etc. Starchy, carbohydrate-dense vegetables like sweet potatoes, winter squash, turnips, rutabaga, beets, taro, yuca, and pumpkin. Our tongue-in-cheek term for pancakes, cookies, muffins, and other “Paleofied” treats and junk foods, all of which are forbidden on the Whole30 program. The “finally, things are getting better/easier/happier” feeling many people experience in the last half of their Whole30 experience. Our Whole30 Timeline will give you more details about what to expect during your Whole30. The name of our business and our community. The “9” in “Whole9” comes from these 9 factors, which we believe come together to promote optimal health. The original 30-day program designed to help you restore a healthy metabolism, heal your digestive tract, calm systemic inflammation and put an end to unhealthy cravings, habits, and relationships with food. For more information, visit the program details. Our 32-day (you get days 0 and 31) subscription email newsletter packed with tips and resources specific to every day of your Whole30 journey. The Well Fed series includes two incredible cookbooks by Whole9 Envoy Melissa Joulwan of The Clothes Make The Girl. Do you have a term or phrase to add? Are you still lost in translation? Add your entry or ask your question in comments below.